Winterizing your home is a great way to stay warm and save on energy bills. This is just as true for your mobile home or trailer, even more so if it is an older model. 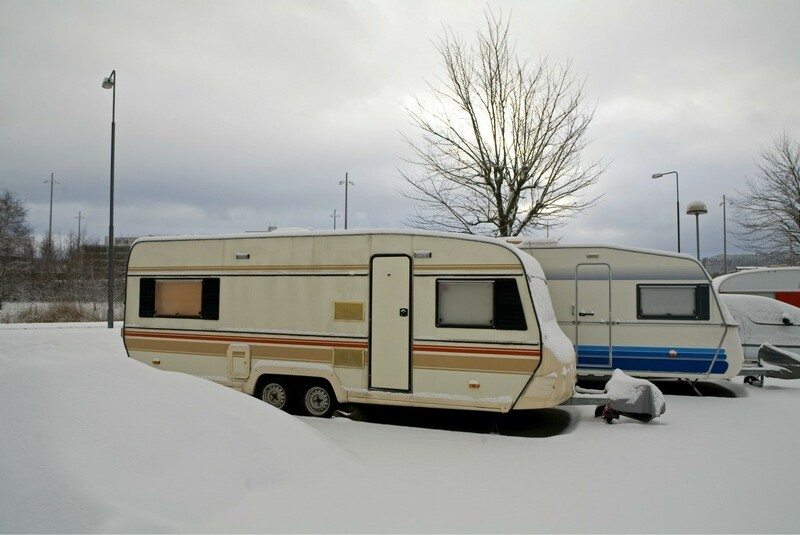 This is a guide about winterizing your mobile home. My husband and I spend the winters in the southern states, living in a travel trailer. We have a string of days where the weather is very cool and that is when I do my cooking and baking, enough to get us by for several days' meals. It eliminates the need to keep our electric heater running and warms up the unit at the same time. I also leave the dish water in the sink and put the plug in the bathtub when taking a shower, until the water has become cold. That adds moisture to the air, which makes it feel warmer. If you have any plants either inside or outside, and your dish washing soap is phosphorous free, you can water the plants with them! Thanks for the good idea! 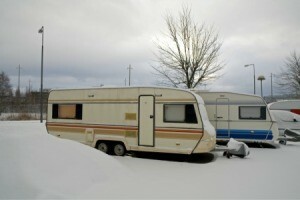 We too are "snowbirds"
Any ideas to insulate my mobile home? The floors and walls are cold and I am restricted on money. Go to a thrift store or the attic of a friend or relative, or go to www.freecycle.com and get curtains or decorative sheets to put up on the wall. Line them with old blankets. You can hang them with push pins. While you're there, get loads of rugs to put on all of your floors, even on top of carpet as heat will be lost downward. While you're at it, cover the inside of your windows with plastic, you can buy inexpensive plastic storm windows at the Dollar Store, and make "draft-dodgers out of old fabric to put at the bottoms of ALL of your doors (interior as well as exterior). Keep the doors to unused rooms shut. Wear heavy socks and put plenty of snuggly blankets and throws on your furniture to snuggle up with in the evening. Newspaper is a great insulator. Apply it to the walls like you were making a paper-mache pinata. After you have a thick layer built up, you can paint it or cover the whole thing with fabric - see the DIY tips on how to make fabric stick to walls. My neighbor was renting and wanted temporary wallpaper and used the fabric technique - it was amazing. So your place will be warm and fabulous. (But don't smoke inside). Call your local Community Action Agency. Ask about their Weatherization Program. If you're income elegible, which it sounds like you are, they will inspect and insulate your home for free! It's my belief that all of these Non-Profit Agencies have been given more money through the Stimulus Package. I also live in a badly insulated mobile home. It took me a long time, but I took one wall at a time, took down the entire wall, and replaced the insulation with better grade and more of it. Then I replaced the wall board (I forget what it's called). As each room got done, I repainted or wallpapered. Now my home is a lot better insulated and my electric bill has gone way down. It sounds like a lot bigger job than it really is. I did all this by myself. But by breaking it down to one wall at a time, it made it a lot easier, plus the cost was a lot easier to bear too, because I didn't have to pay for it all at once, or put it on a charge card with exorbitant interest rates. Go to the "community action agency" found in the county office of your area court house; they have helped my friend with her mobile home issues. Ask a clerk in the court house where these folks are and they can point you in the right direction. Good luck and keep us posted on what you do. Dear Cumberland: Please don't advise paper in the walls. It gets wet and even if it doesn't, it is a horrible fire hazard. Heat rises, so do go to the local community action agency and get an energy audit. If you qualify you can get the belly board redone, which is a band of sheathing under the trailer that holds in the insulation. Chances are yours has been eaten away by critters and or time. Good luck. Thank you for your responses. I will call tomorrow to see if someone can help me. I'll keep everyone posted as this goes. I called CL&P for help. It costs $75 dollars for them to come in to inspect. They do not install anything for insulation. I have to get a contractor to write out the price and they will rebate me about 8% of the cost. Wanted to get this info back to all of you that were trying to help me. If you have central heating, turn your heat up to about 72 degrees during the day. Your rooms may still feel cold. If so, get some space heaters for the rooms you spend the most time in such as your living room and your bedroom. You can get good space heaters at Fred Meyer for about $40 to $60 dollars. Get ones with a digital thermostat that will turn off and on automatically. Run them only when your home. Insulating your home better is a long term goal you can work on as you get the money and have time. You can beef up the R-factor of your crawl space by adding some foam board insulation if you don't have a skirting with a high R-factor. Remember to cut vents in it if you do this. Good luck. I need some advice about a mobile home/trailer. Here's the situation. I bought my father a mobile home back in 93. It is a nice well maintained home, but it is now 30 years old. My father recently passed away and now I have this trailer to deal with. I was there yesterday and the kerosene furnace is almost out of fuel. Kerosene is around $3 a gallon here, so I would like to put a minimal amount in the tank for now and possibly winterize the home, drain the water, close it up until it's sold. I was told I can expect to use around 4-5 gallons a day to heat it. I simply can't afford to waste this money heating an empty home. Does anybody have any thoughts on how to go about this, what do I need to do, who I should contact? The expenses are going to start piling up shortly (fuel, taxes, lot fees, etc.). I have other issues with this, but I will post them separately. I'm 20 minutes south of downtown Pittsburgh in case anybody here needs a nice, cheap place to live. Thanks for reading! I would call a local mobile home sales company, and ask them how to winterize it. They should be able to help you do that so that you don' t have to heat it for the remainder of the winter. People do it all the time for "hunting camps". Good luck, and condolences on your father. Wrapping heat tape around the water pipes helps keep them from freezing...You can get bails of hay/straw and pile up around the ouside frame of trailer, You can apply plastic around the windows and you can buy it cheaply at Walmart on the roll for a lot less than the window kits. You could close off some rooms where heating isn't necessary with a wall of plastic sheeting (again off the roll) and that helps a lot. Put rolled rugs under the door of rooms that are closed off for the winter and insulated drapes or curtains over the windows to the rooms you are having to heat. Leave bathroom cabinet doors open so heat can get to the pipes to help keep from freezing up too until you decide to drain the water lines and/or shut off the water supply. Set several mouse traps around in each room so mice cannot chew/damage/make nests. Thank you for responding. I called the mobile home guy that my Dad used for repairs (he was disabled) and he said with the older pipes you are better off not winterizing because of corrosion of the pipes. To do it while it's really cold and snowy would probably cost me as much as the kerosene I had delivered yesterday, $345 for 100 gallons. OUCH! I turned the heat down to 60 and I plan to visit several times a week until it's sold. I just pray that it is soon. I feel for you young people who never were required to learn how things are done. Just drain the water and drain pipes, including sink and toilet and shower traps, and cut off the utilities. Can't drain those traps? Fill them with car windshield-spray solution or rubbing alcohol. I grew up in northern Minnesota. We built a small summer resort and had to winterize ten cabins every single year! There was no money to call in the so-called "professionals". When that happens a person learns rapidly. Listen to tomatoehanger and phooey with the professionals because most of them have a self serving agenda! Since you have just put in oodles of new kerosine you'll be able to prove to a serious buyer, who actually places a real offer to purchase, that the heating system works and all you have to do to prove the plumbing works is to turn the water back on again and drain and turn off again until the closing papers have been signed! Just make sure everything is documented and signed in writing by the buyers and possible inspectors that you proved the heat and plumbing works fine! Good luck to you for a speedy sale! PS - God Bless your heart for having purchased the trailer for your daddy! My husband and I run a mobile home moving business and have our own rentals. I know something about your problem that can help. First wrap the outside pipes with insulation like the stuff they sell at hardware store for pipes. Turn the water off to the mobile home. If the mobile home is underpinned or has some sort of skirting (around the bottom of the trailer to the ground), then the pipe should be okay underneath the home if you do the following. First, pull the main breaker to turn the power off to the home. And also flip the breaker for the hot water heater. Flush all the toilets in the home. Turn on all the faucets and let the water run out of them. This will be after you have turned the water off to the home. Add anti-freeze (like you put into car radiators) down as many of the sink holes you have in the trailer. Pour this also into each commode and also the tank. This will keep the water that's left in the pipes from freezing. Be sure to tell who ever buys the home that they need to be sure to let the water in the hot water tank refill before they turn the hot water breaker back on or they will burn the elements up in the tank. Cold water hitting hot elements will cause your new owner to have to buy new elements or worse a new hot water heater. Also, the new owner will need to run the water in the sinks before they use the water for personal use to run the anti-freeze out of the lines Everything else in the home will be fine. I'd also leave the refrigerator door open because they can really begin to smell foul if left shut for a all period of time. Good luck with the sell. I took care of houses for realtors for years and once lived in a mobile home. You do need to leave the heat on as winter can occasionally cause stress damage if left unheated. However, you can leave the furnace turned down to 60 degrees. A work light left on in the crawl space will keep the crawl space and pipes warm and lower heating costs a bit. Put foam insulation on all the pipes. To winterize the water lines, get someone who is a professional. If done wrong it will do damage. Make sure the hot water tank is drained, and refill it before turning the power back on. You may not want to put plastic on the windows as it gives a buyer the idea that the place is cold in winter. I would not do it. You want to stage the trailer, just like they do for houses. Do not take out all of the furniture until it is sold. Put a de-humidifier into the trailer to reduce any moisture in the air, that will also help lower the heating costs. I live in a 1976 single wide mobile home. I have sealed the windows, plastic plus blankets, used sheets to "lower the ceiling", built entry walls to block door leaks, and have a sheet wall to enclose the living room. We're still freezing. We use space heaters, and had 2 running this last week, and I could feel icy whisps of breezes. This home was neglected almost to it's demise. I'm becoming quickly efficient in repairs, but need advice on how staying warm! We sleep in the living room. (2 babies under 3 yrs old) There are space heaters in the bathroom and living room. I applied for county help; still waiting. I had a $250 power bill for December. We can not financially, or physically, withstand another 3 months. Seriously limited funds, but I'll make it work. Thanks for your help! My mobile home is a 1992 with a garage. I have noticed the only room in the house that's even remotely warm is the small bathroom. I have shut down 3 rooms so far and it's still cold. Plastic has been put up on the windows but it seems there are not enough vents in any of the rooms. The walls are also cold. Does anyone know if it is alright to close off registers and put blankets on the bottom of the doors in a mobile home?Any advice? Over the past winter, our mobile home's linoleum floor split in several places. There was no sign of water damage -no leaks - just several slits in the linoleum. It was a very cold winter. What flooring would hold up best during another very cold winter? I have an old trailer in southern Illinois, and my electric/gas bill was $211 for this month. Compared to the summer when it was only $100. I have plastic on the windows and a skirt around the outside. Is there any way to cut this cost and keep my trailer warmer? I too live in a mobile home. But, I won't even call it a mobile home. It's really just a tiny old trailer, (a 1981) so it's old and drafty! (But at least it's paid for!) Here's some of the things that have helped me. Some I've already done and some I'm going to do. A little at a time as money allows! RUGS and THICK PADS: Put rugs everywhere, the kitchen, bathroom, over wall to wall carpeting and hung up inside on the outside facing walls. Use a 1x 2 behind the top of the rug and be sure to find the studs if its a large rug! Also, use rug pads for even more insulation. The best insulating rugs are made from 100% wool, but any rug will help, synthetic is better than cotton. Cotton rugs do NOT last!... Bu used rugs at thrifts shops and yard sales then wash them with shampoo, a sponge mop and the hose during the summer or buy them on sale at import and liquidation stores. I bought 2 ($600) 100% wool sample rugs at home depot last summer for only $60 each! ... They were discontinuing their sample and getting new ones. RIGID FOAM INSULATION: This comes in a 4' x 8" sheets and in different thickness. (It looks like foam board for crafting, but larger and thicker) You cut it with a jigsaw, an electric carving knife or (not as good) with a box knife and a yard stick. It comes in different thickness from half inch to 2 inches thick and in-between, it cost around $10 per large sheet. which can do about 2 windows. Put it inside your window-well or outside in your window-well with plastic over it. I like tablecloth plastic (sold by the yard) in Walmart or fabric stores. I also used a dollar store shower curtain that matched the color of my trailer so you don't see the foam-board insulation behind the clear plastic. I put foam insulation inside and outside my VERY large picture windows (followed by plastic) in my craft room and now I can heat the room up using only my body heat and the light bulbs in the room! I'm not kidding, even when it's 20 degrees or less outside, it's still warm in there with NO heater on and the door to the trailer shut, at least now that I've put the foam in the windows it's warm! Last year (before the foam) I had to constantly run a space heater in there. But on the down side, you will have to give up your outside light because you can't see through the Styrofoam. But if you don't want to stop light from getting in, then only use the foam insulation on the bottom and use clear bubble-wrap on the top half of your windows. (or just bubblewrap) With the bubblewrap, you won't be able to see out, but the light will still filter in and you'll have super-insulated windows! (and just think of how much heat we loose through our windows!) You won't need much to hold the bubblewrap up because the moisture from the window will probably do the trick... If not, then buy some of those tiny clear suction cups at the dollar store and suction the cup to the window then poke the wire on the suction cup through the back of the bubblewrap. Put the suction cups here and there and especially at the 4 corners. THICK CURTAINS: Hang washable old Blankets or Quilts, or a piece of thick washable fabric under your curtains with thumb tacks or push-pins, or at least hang rolling blinds under your curtains. If you just have mini-blinds then you can still add rolling blinds under them to help keep out drafts. The blankets will help insulate your windows where most of your power is being lost. You can also attach mylar, bubble-wrap (see below) or plastic bags to your windows and the moisture will make them stick. If you are going to hang blankets from the thrift shop, the bags will help the blankets not get wet. But the best thing is to sew your own insulating curtains. They make a special curtain-backing you can buy or order at fabric stores that you back the fabric of your choice with, but you can make your own and it consists of a mylar or plastic backing (that goes next to the window) then a fleece type of thicker fabric and that is followed by a thin quilt batting. Then you can add another layer of plastic or mylar, then lastly, you'd add your fabric of choice. This last layer of fabric is what you'd see in your room. I'd recommend "Construction Bags" as the best plastic to sew with. These are available at Walmart. They are huge, thick bags for job sites. They are much thicker and larger than any other bags you can buy. FLORESCENT LIGHTBULBS: Put new florescent swirl lightbulbs in all of your lights. If you can't afford Tthe cost, then at least put them in the lights you use the most or tend to leave on. For example, for us we tend to leave our hall light on and our kitchen light. Also be sure to put low wattage lights in your front and back porch lights! Our power company gives florescent bulbs away free. I just go to home depot and there's a coupon you use at the register. All you have to pay is the tax. Call you local power company and ask about it and also ask Home Depot if they have coupons for free florescent bulbs too! FOAM OUTLET COVERS: these go behind each outlet on an outside walls to stop the cold and drafts... Go ahead and put you hand on an outside facing wall where the outlets or lightswitches are, you'll be amazed at how cold they feel! NEW WEATHER STRIPING: If you can see daylight in the crack (by the side of the door or window), you need new weather stripping. After I added new weather striping to my outside door in my craft room it made all the difference! DRAFT "SNAKES": Sew or buy those fabric snakes filled with sand or that you put at the foot of your doors to keep the drafts out. NEW FURNACE FILTERS: Buy a new furnace filter ever 3 months. This way the furnace is more efficient because the dust isn't clogging it. FURNACE CHECKUP: IF you have your furnace cleaned, adjusted and serviced once a year it will pay for itself in efficiency. LOWER HOT WATER HEATER. Most of us can turn down our water heaters to save power. SHOWERS: Turn off the shower while you're shaving your legs or conditioning your hair and if you have a teenager, set a timer in the bathroom so they'll take shorter showers. LESS LAUNDRY: If you have kids especially teenagers, buy them each their own colored towel and tell them you'll only wash it once a week so don't leave it laying around on the floor! TURN OF TV: We all know that besides all the heating appliances like the Dryer, Oven and Furnace that the TV is next in line for how much power is used. And don't forget to turn off your computer when not in use, especially if you have an old fashioned box type monitor like I do. TOASTER OVENS and MICROWAVE: Why heat up the big oven if you can use the toaster oven and why waste power boiling water on the stove for one cup of tea when you can just use the microwave which uses much less power. POWER STRIPS: Your cable box, TV, DVR, coffee maker and microwave all use power even when they aren't on... They just keep on sucking and sucking from the meter a little at a time. If you hook your small appliances up to a power strip then you can turn them COMPLETELY off. KEEP A WARM SWEATER HANDY: In our house we each have several "fuzzy jackets" I picked up at the thrift store. I like them because they can be thrown in the washer and dryer. They are thick comfy jackets made from berber-fleece for wearing around the house and we find they help us not turn up the thermostat as much if we keep them handy and instead put them on. I like to keep one on the back of my computer. KEEP A LAP BLANKET BY YOUR COMPUTER: I get cold when I'm on the computer so I like to use my lap blanket instead of turning on the furnace and heating the whole house. HEAT ONLY ONE ROOM: If you're home by your self, why heat the whole house? I'll just use a space heater in my room when I'm in there watching TV instead of using the furnace. Or even better, I'll use my electric blanket or my comfy-warm down quilt instead! TURN THE HEAT OFF AT NIGHT: We turn our heat off at night, or at least turn it WAAAY down to almost off (just high enough so the pipes don't freeze) then we each bundle up with our warm blankets. I seem to sleep better when my old and loud furnace isn't going on and off all night long anyway. If you have kids, tuck a warm hot-water bottle at the foot of their bed under their blankets. This will help keep their "tootsies" warm. INSULATE UNDER YOUR TRAILER: If you can afford it next summer, it would pay for itself to insulate under the trailer or at least inside the skirting. That's why I told you to hang rugs or the wall and to use extra rugs on the floor. PET DOOR COVER: Do you have a kitty or doggie door? I do, and It made all the difference when I made a cover for my cat-door! ... I glued 2 mouse pads then glues 2 pieces of funfoam ($1 store) to the mouse pads and after the very last piece of foam (the back) I glued 6 magnets then put a last layer of foam over the magnets. The way it works is I put the mouse pads right up next to the cat's door then the magnets stick to the metal door.... I usually only put it on the door when I know the cat is sleeping or down for the night, but he knows how to take the cover off by himself. If he wants to remove the draft-cover all he does is take his paw and pull on the cover and it flops on the floor... If he's outside and wants in, he can push his head through the cover and the magnets flop off. IF you don't have a metal door, then I suggest you use magnetic tape on the door so the magnets have something to hold on to. For more info about how to make this pet-door cover send me a note. FREE WINTERIZING: In our area, our power company offers a free winterizing program for low income homeowners. They send you some paperwork to fill out and they call you to make an appointment, then they come to your home and tell you what you can do to winterize your home and some of it they will do for you for free, like putting plastic on the windows. In other states they have free winterizing kits (with outlet covers, weather striping and window plastic) for low income families. If you think you may be eligible, call your power company and ask. I also live in a 1984 trailer and one of things you can do is to take your register vents out and check for drafts, believe me, you will find a lot of them. When your trailer shifts like it does in zone 5, your heat runs will split. Duct tape or caulk them. The first poster had some great ideas, but let me add my 2 cents. It is not enough to just turn off the TV, computer, DVD, etc. The BEST thing to do is unplug them, because as long as they are plugged in they are "energy vampires". Their are power strips that allow you to turn on an off the power supply to a few different appliances at a time. The power strips are a bit on the pricey side initially, but in the long run, they are easier than plugging and unplugging things and they will pay for themselves. I use my cell phone as an alarm in the morning and so don't have an alarm clock plugged in all day long. One other suggestion is to make sure your vents are not blocked by furniture, etc. so the heat can flow easily and also close the doors to your rooms. It will help keep heat contained. Lower your thermostat during the day when you are not home and them turn it up when you get home. I turn off the stove burners a couple of minutes before I am done cooking and find that the burners stay warm long enough to complete cooking times efficiently. As another investment- there are individual solar panels that would generate enough power to run a space heater and so that - although a larger outlay of money initially, can be used to help offset turning the heat lower as well as you can use the solar panel any other time of year to run other things. Hope this helped. I, too lived in an old, cold mobile home - and the heat pump was not that efficient. Oops - one more thing - make yourself a "rice sock" you take an long sock - fill it with dry rice (I buy the dollar store kind) then tie a knot or sew the end of the sock. First off, than you for the wonderful advice above. That took a lot of time, and you are nice to help out. I have even pasted and copied it, to serve as a hand out for the energy assistance people I help. Yes, those heaters are wonderful. They run on recycled oil, so they can't combust and are completely renewable. I can also suggest electric blankets, battery powered heated massaging chair pads, and even battery powered sock! Keeping the body warm is more important than keeping the air around you warm. Wrap all your pipes, keep the under the sink doors open in the kitchen and bathroom, and see if your eleactric company can do an equal pay. This allows you to pay the same all year. That way, you are paying less in the winter when the bills are high, and more in the summer when the bills are low...but the bill is the same amount each month. One last thing, if you can, tear off the skirting and put some bales of straw underneath. See if the local energy assistance folks can come out and crawl under the trailer. Chances are, your bellyboard (the support for the insulation underneath the trailer) is compromised by critters or just time.